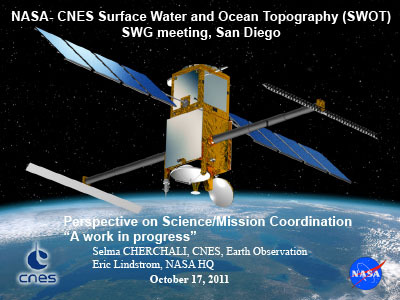 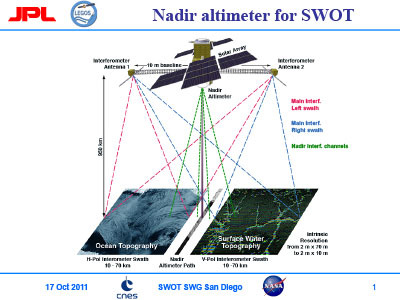 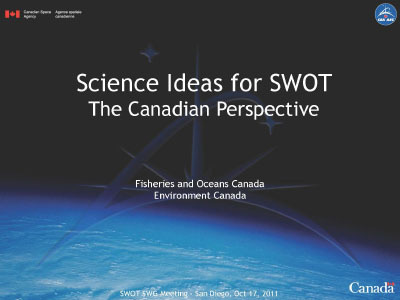 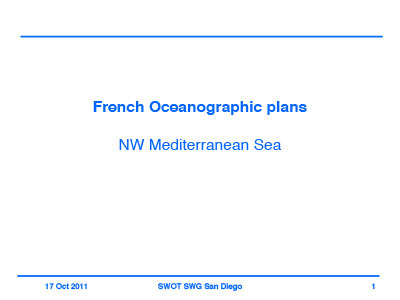 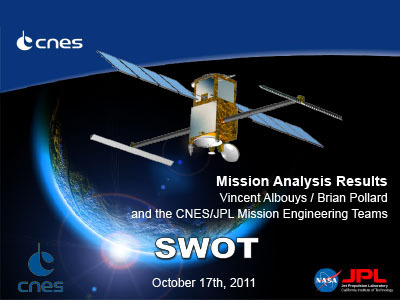 The Surface Water and Ocean Topography (SWOT) mission held a Science Working Group Meeting in San Diego, California on October 17, 2011. 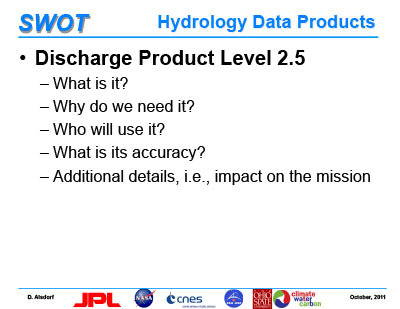 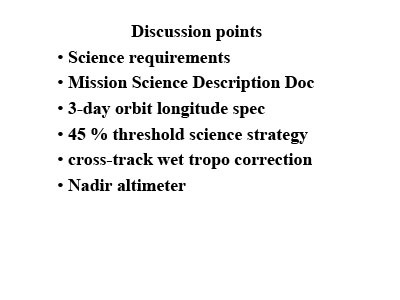 With nearly 60 participants, the meeting's objective was to develop SWOT mission science requirements, discuss calibration/validation activities, and prepare for the Mission Concept Review. 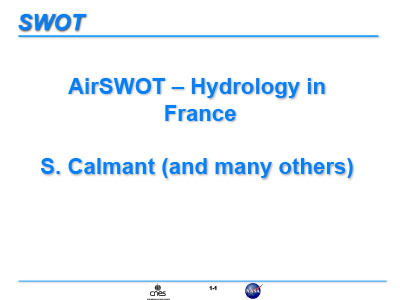 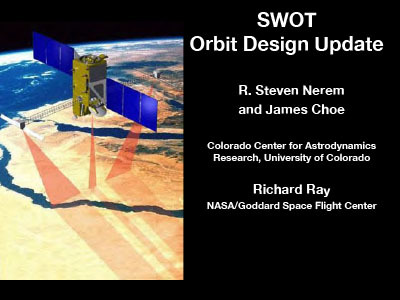 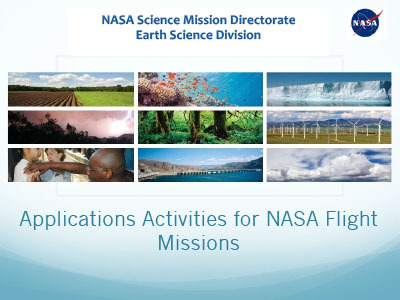 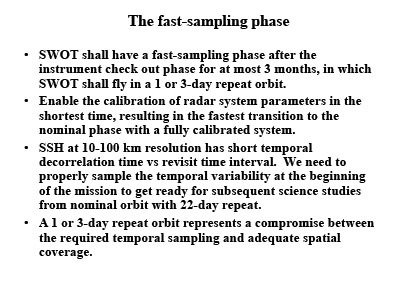 Presentation topics included the status of agency programs and flight project, participation of the Canadian Space Agency, science data products and algorithms, SWOT's fast-sampling phase, and applications efforts. 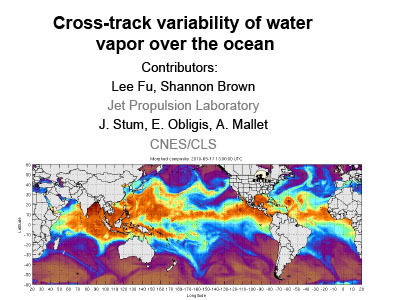 Specific issues related to the nadir altimeter and variability of water vapor over the ocean were also discussed. 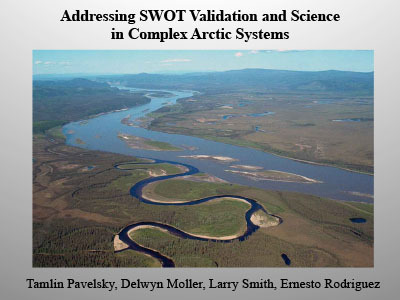 [17-Oct-11] Pavelsky, T., Moller, D., Smith, L., and Rodriguez, E.
[17-Oct-11] Chao, Y. and Rodriguez, E.
[17-Oct-11] Alsdorf, D. and Srinivasan, M.
[17-Oct-11] Fu, L-L., Brown, S., Stum, J., Obligis, E., and Mallet, A. 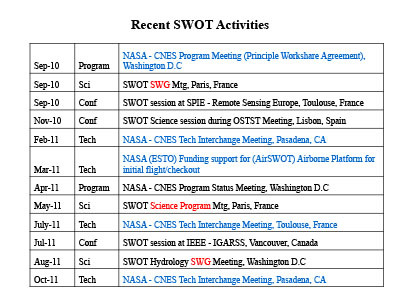 [17-Oct-11] Fu, L-L., Morrow, R., and Rodriguez, E.
[17-Oct-11] Alsdorf, D. and Biancamaria, S.
[17-Oct-11] Albouys, V. and Pollard, B. 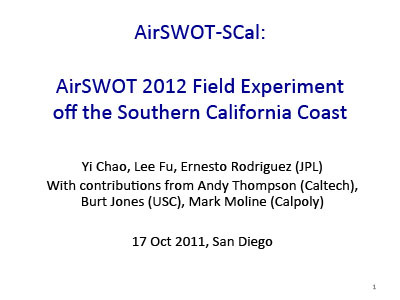 [17-Oct-11] Vaze, P. and Lafon, T.
[17-Oct-11] Lindstrom, E. And Cherchali, S.
[17-Oct-11] Nerem, S., Choe, J., and Ray, R.